That's right! It's Theater Thursday! This week I'm featuring the movie Wise Guys. This movie was made in 1986 (you guys know I love me some 80's movies), however I had never seen this one until this past weekend. I have never laughed and smiled during a movie so much. It had me entertained from beginning to end. The biggest star in the movie (at least to me ) is Danny DeVito. Now there is some note worthy actors in it, but I just can't remember their names. You know those actors I'm talking about. The ones that you see on random shows and have bit parts in big movies, yet you never know their name. Well it has a lot of those in Wise Guys. 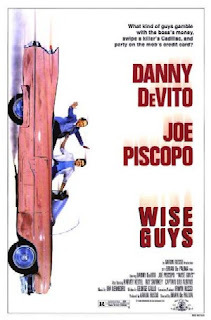 The basic plot for Wise Guys is: 2 guys (1 being DeVito) are street runners for an organized crime group. Well they place a bet that lands them in hot water. They are forced to flee town while trying to figure out what to do that will not result in them getting killed. This whole movie takes place in New Jersey (shout out to the real housewives) and at Atlantic City. Check it out...you won't be disappointed. I promise. Don't forget my giveaway ends on Friday night!! Enter! I left you a blog award on my blog! You're blog is so cute I couldn't resist passing something on! I've never seen this, but I love these two guys. I'll have to check it out! I will have to check it out! Difintely sounds like a good way to pass a few more hours! I think I've heard of this, but don't believe I've ever actually seen it.